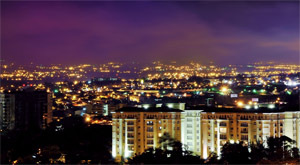 The capital city of Costa Rica is San Jose. San Jose is nestled in the heart of the Central Valley between giant volcanic mountains and miles of green foothills. With a resident population of over a million, San Jose is a large urban city. Relative to other South American cities, it is also a modern city. San Jose's architectural style is commonly referred to as "Caribbean Victorian". That's because of the city's unique history. The classic style was established during its initial development in the late 1800s, around the time Costa Rican coffee became a major export. A modern building boom in the 1950s and 60s gave the skyline its share of high-rises, which still stand tall today. Of course, San Jose is the heart of Costa Rican culture and the country's beloved traditions. You will want to check out some of the excellent museums. San Jose's central district has a highly-recommended bookstore called 7th Street Books with lots of English language books on Latin American literature, biology and natural history, plus great wildlife guides. There is also a nice restaurant in the area called Café Mundo. This gorgeous country is very accessible. San Jose's nearly perfect equatorial weather attracts foreigners from around the world. Most travelers arrive by air into Costa Rica through the Juan Santamaría International Airport (SJO), which is not actually in San Jose proper, but rather in the nearby suburb of Alajuela. Similar to other major metropolitans, there is a lot to do in San Jose. There are many excellent attractions in and near the city. A number of tours take visitors to historic buildings, museums, and zoos. Coffee plantation tours are particularly popular. Shop 'til you drop. Costa Rica isn't known for clusters of craft markets commonly seen in Mexico, Guatemala or the Caribbean. However, shopping can be great fun! Travelers will find Costa Rican coffee, rum, leather goods, and woodcarving at reasonable prices throughout the city. The Farmers Market is a delightful place to spend an afternoon. You'll find fresh fruits, vegetables, herbs, and spices. And Mercado Central—a local flea market operated since 1880—is another noteworthy shopping area where you can find just about anything at bargain prices. Dance the night away! San Jose has a variety of toe-tapping nightlife. Ask your hotel concierge for a recommendation. Costa Ricans love to dance, so the dance floors can get quite crowded with folks of all ages. Get out there and have fun! Other local activities include golfing and bird watching in tropical wilderness. For the adventure traveler, San Jose offers access to an abundance of fantastic, calorie-burning activities. Hike one of Costa Rica's famous volcanoes. Charge through the rainforest on a zip line. Spend the day doing yoga at a hidden retreat. Perhaps nothing is more exciting than whitewater rafting down one of Costa Rica's rainforest fed rivers. We strongly recommend taking voyage. Branch out and explore Costa Rica. Of course, San Jose is the transportation hub to other popular Costa Rican destinations. Whether you want to go north to Monteverde to see the cloud forest, take a jaunt to the Caribbean side of Costa Rica or explore the spectacular Osa Peninsula, San Jose will have a the flight, bus or car you need. The Aerial Tram Tour is one of the most popular attractions. It consists of a cable car ride above the rainforest floor at various altitudes. Hot air ballooning, horseback riding, and bungee jumping are among other favorite activities in various parts of Costa Rica. Is Escazu for you? A large population of expatriates lives in Costa Rica full time. A few miles southwest of San Jose, in the suburb Escazu, you can find a high concentration of foreigners, primarily North Americans. English is readily spoken and U.S. visitors will find some familiar comforts of home, like an English speaking movie theatre. Escazu is considered a posh and trendy community. Not surprisingly, it boasts many upscale amenities including a car wash, bowling alley, and county club, as well as a number of fine restaurants.